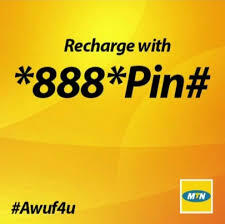 Mtn Awuf4u has been on for some time now , I've actually used it myself and it's pretty awesome . You get 200% bonus on recharge below 100 Naira and 300% bonus on recharge of 200 Naira and above to call all networks at 45k/sec and 28 international numbers at 60k/sec. Also you can enjoy PAYG browsing of 15N/M , free SMS to all network and more. To get this bonus offer just use this code when recharging *888*recharge pin# , and you'll receive the bonus . To check balance dial *559*14#. Note: Recharge of 100 and 200 Naira lasts for 14 days while recharge of 200 Naira above is valid for 30 days.